R.E. Lacault returned to New York, accompanied by his wife Alice, on 11th August 1923. The ship, named Paris, took almost a week to cross the Atlantic Ocean from the port of Le Havre, in France, to get to the one in New York. At that time Lacault was still an associate editor of Radio News magazine. He left that appointment almost two years later, in May 1925, after more than four years with that magazine, to begin a new adventure as a manufacturer of radio sets. His first article appeared in December 1920 of Radio News (he became associate editor in January 1921), it is in that year when he came from France where he spent four years, as an engineer, in the Radio Research Laboratories of the French Army Signal Corps. As known, Lacault described his first Ultradyne receiver in the February 1924 issue of the magazine (Ref. 2). He asked for a patent for his invention the 29th of April 1924 (Ref. 1). In the July 1922 issue of Radio News there is an article (that probably is lost to those interested in the Ultradyne) where he describes a better system to receive C.W. signals by a “Modulation Method”, looking to the schematics we can recognize the basics of the Ultradyne circuit (see figure and Ref. 3). In this article Lacault mentions a certain Mr. R. Jouaust. Who was he? Captain Raymond Albert Jouaust was an engineer who was part of a team of experts selected by Colonel Gustave Ferrié, who was the Technical Director of the Military Telegraphy in Paris, during the war 1914—1918. Adjutant officer Lucien Lévy, the inventor of the superheterodyne, was part of the same team. 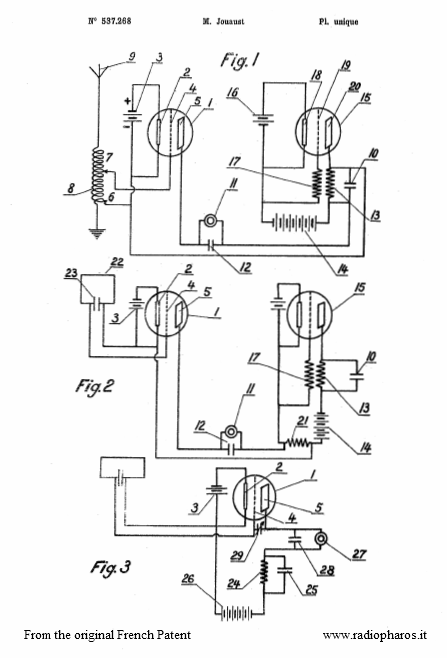 Ferrié stimulated his collaborators to adopt the “tube with three electrodes” in the design of new receivers and transmitters circuits. In a paper, dated January 3, 1922 (Ref. 4), Jouaust described a new circuit for detection, by using “modulation”, to receive C.W. or AM signals with the old heterodyne system. He envisioned a detection circuit much more effective than those used until then employing a tube or a galena type detector to "rectify" the antenna signal by beating it with a local oscillator. 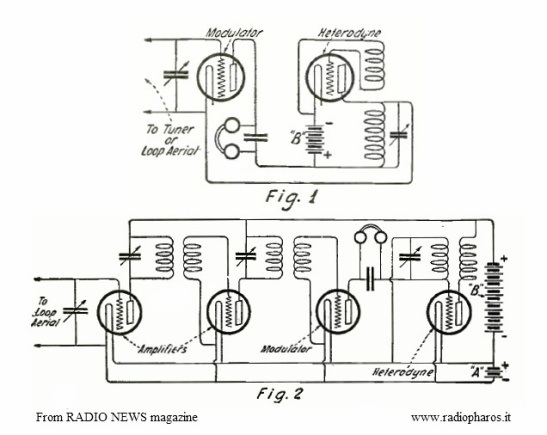 His circuit, much more sensitive than the traditional ones, used a tube with three elements (triode) where the RF signal was applied between the grid and a common point (ground). The local oscillator signal was injected, through the headset coil with a capacitor in parallel, to the plate of the triode. In this way the RF signal was "modulated" by the local oscillator signal to create a beat in the audio range. As noted by Jouaust, practical tests demonstrated the excellent behavior of the circuit and no difference in performance was noticed by removing the positive DC voltage from the plate of the triode. As with the traditional detectors circuits; if the oscillator frequency was identical to the RF frequency, amplitude modulated signals (AM) were received, if the RF signal was a non modulated telegraphic one (CW), or continuous wave, the oscillator was moved in frequency to hear the note. The resulting “beat” or mixed signal was always in the audio range. Nowadays we call it “Direct Conversion”. Jouaust applied for a French Patent in June 22, 1921 which became such in May 19, 1922 with N° 537,268. He applied for a British Patent in June 12, 1922. Typical configurations are shown in the figures of the original patent (see below). Mr. Jouaust circuit reminds the “Modulation System” used by Mr. Lacault. It is evident that the latter has been influenced by the Jouaust circuit but this does not deny any merit to him because the Ultradyne mixer was applied to a “real” superheterodyne, that is with an intermediate frequency not in the audio range, as was usually done with the heterodyne receivers (long before the invention of the superheterodyne) and as Jouaust did, but with an IF much higher (that of the Ultradyne L1 was more than 100 kHz). Another merit to Lacault is to have described his circuit in a clearer, detailed and "modern" manner. I think also L. Chrétien had been inspired by the Jouaust circuit for his Strobodyne mixer (Ref. 10). We can say, without a shadow of doubt, that Mr. R.A. Jouaust was the originator or initiator of this simple, innovative and original RF mixing circuit. 1- R.E. Lacault – Radio Receiving System – Patent N° 1,740,946 - December 24, 1929.